I woke up happy, I'd had an okay-ish night sleep but was enjoying a lie in because I didn't have any lessons before break. So off I trotted at about 9am to get the public bus, the bus usually arrives at about 7 minutes past (I got there at about 9.03) anyway, I waited until 9.15 and it still didn't come. On top of that, the short walk had allowed me to notice that my jeans don't fit me any more and they would not stay how I put them and that my shoe lace would not stay done up; so essentially my well thought out outfit wasn't looking so well thought out after all. I was also becoming increasingly more self-conscious about a spot that had developed on my face which I would compare to the grand canyon-don't ask. Anyway I went home and spilt chicken soup on my top, so had to change. Watched a bit of Jeremy Kyle and 'towie' (SOUL DESTROYING STUFF) and went off to get the next bus. If I'd been able to get this bus I'd have only missed one lesson, however it turned out to not even be going to where I needed to so I went home...again with zero transport options left. This resulted in me missing another business and politics lesson (I missed two last week because I was off ill) and an English lesson, as well as a much needed catch up with my friends. Because I have Friday's off, when I have a day off I end up only doing three days a week, which always results in me feeling like a bum! I always work at home on my days off but my cats being super needy at the moment; you try revising with a kitten trying to get as close to your face as humanly (or felinely) possible! Wow it sounds even more pathetic now I've written it down. Apologies to the people who have had genuinely bad days today, you are probably finding me infuriating. I can't actually complain too much anyway, I got some work done, have the time to blog and a day inside is probably better for my on-going cold/flu anyway. I'm going to stop rambling now. I am not sure how I wrote four paragraphs about my incredibly boring day...probably all the cat company making me a little crazy. 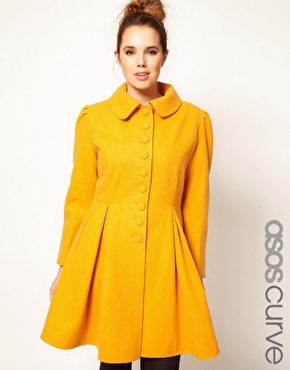 I did come here with a purpose...oh yes, ASOS's new curve collection! I've read many an article where women who aren't thin/slim have stated that they simply avoid fashion. I once even read "I thought that fashion wasn't for people like me", which I think is really sad because fashion is for everyone! Fashion is in all areas of culture and life, not just clothes. Everyone experiences a form of fashion every day in one way or another even if they don't realise it. On top of this, no matter what shape or size you are, there are certain items women have to avoid. There are loads of things I can't wear because I'm too short to pull them off. On top of this, I am grateful for being naturally slim but I have often received judgement and criticism for my size, and often wish I had a different figure. My point being, no matter what size you are, you can make fashion work for you and no matter what size you are, there will be times when you hate it and feel as though it's 'wrong'. I believe that as long as you're healthy, weight and size do not matter at all. Enough of my philosophical outlooks on life though, check out the collection here: ASOS CURVE COLLECTION and see my favourites below. P.s. If the sizes are a little too big for you, but you'd still describe yourself as a curvy girl, simply take note of the styles, cuts and shapes used as they have all been chosen in order to flatter curvaceous women!